I have been experimenting with Cubist painting. This one is a sunflower in a blue vase. I have fractured the image, bringing some of it closer, and playing up the lights and darks. 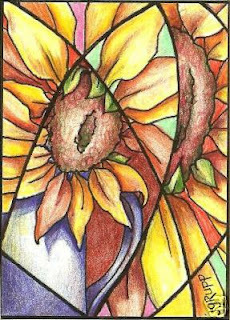 This is done in the ATC - Artist Trading Card - format, 2.5" x 3.5". The medium is prismacolor pencils. I have been using this format to do Cubist studies before I go to the canvas. My ATCs can be purcased on eBay. Under the Art category, search on "JGG" - all my auctions have my initials in the title. I have a goal for 2008 to produce 100 ATCs for the eBay auction. Check them out during the year and thanks for looking!